MoviePass is losing money. This isn't news — the venture hasn't been profitable since it started out. The hope is to eventually make money. That hasn't helped Helios and Matheson Analytics, though, which owns 92 percent of MoviePass. The company's stock price has been tanking, which prompted its board of directors to approve a reverse stock split that took effect at the end of trading yesterday. This hasn't improved matters yet; since opening this morning, shares have fallen nearly 40 percent. A reverse stock split is when a company decides to reduce its total number of available shares by more or less combining them. Say, for example, a company has 1,000 shares trading at $1 each. If that company were to undergo a 1-for-10 reverse split, it would then have 100 shares worth $10 each. 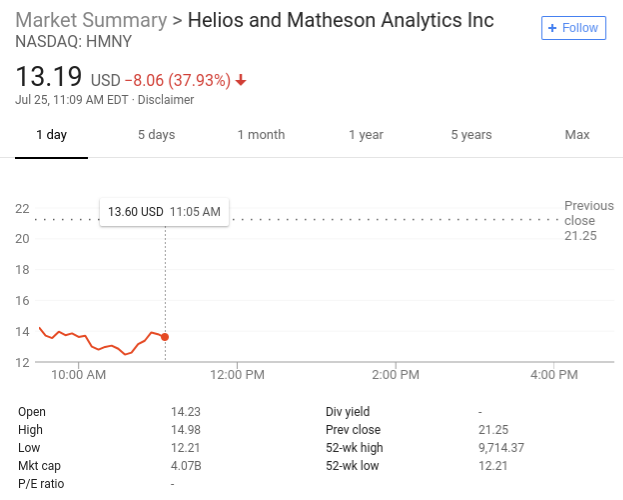 Helios and Matheson, which trades under the symbol HMNY, had recently been trading at 10 cents and below. At the end of trading yesterday, before the reverse split took place, shares were just under nine cents apiece. Following its 1-for-250 reverse split, new shares were worth approximately $21.25. As of writing, they're trading at $13.19. HMNY peaked at $32.90 per share last October following the firm's acquisition of a majority stake in MoviePass the preceding August. Had the same reverse split occurred then, the resulting stock would have been valued at more than $9,000 per share.